For other uses, see Zenith (disambiguation). "Zenith angle" redirects here. For the novel, see The Zenith Angle. Look up zenith in Wiktionary, the free dictionary. The zenith (UK /ˈzɛnɪθ/, US /ˈziːnɪθ/) is an imaginary point directly "above" a particular location, on the imaginary celestial sphere. "Above" means in the vertical direction opposite to the apparent gravitational force at that location. The opposite direction, i.e. the direction in which gravity pulls, is toward the nadir. The zenith is the "highest" point on the celestial sphere (meaning it is the farthest up from the gravitational force). Zenith is sometimes used as a given name, most commonly for males. The word "zenith" derives from an inaccurate reading of the Arabic expression سمت الرأس (samt ar-ra's), meaning "direction of the head" or "path above the head", by Medieval Latin scribes in the Middle Ages (during the 14th century), possibly through Old Spanish. It was reduced to 'samt' ("direction") and miswritten as 'senit'/'cenit', as the "m" was misread as an "ni". Through the Old French 'cenith', 'zenith' first appeared in the 17th century. Shadows of trees when the sun is directly overhead (at the zenith). This happens at the solar noon if the tree's latitude equals the sun's declination at that moment. The term zenith is sometimes used to refer to the highest point, way or level reached by a celestial body during its apparent orbit around a given point of observation. This sense of the word is often used to describe the location of the Sun ("The sun reached its zenith..."), but to an astronomer the sun does not have its own zenith, and is at the zenith only if it is directly overhead. In a scientific context, the zenith is the direction of reference for measuring the zenith angle, the angle between a direction of interest (e.g., a star) and the local zenith. 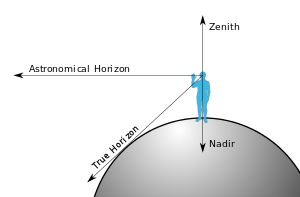 In astronomy, the altitude in the horizontal coordinate system and the zenith angle are complementary angles, with the horizon perpendicular to the zenith. The astronomical meridian is also determined by the zenith, and is defined as a circle on the celestial sphere that passes through the zenith, nadir, and the celestial poles. A zenith telescope is a type of telescope designed to point straight up at or near the zenith, and used for precision measurement of star positions, to simplify telescope construction, or both. The NASA Orbital Debris Observatory and the Large Zenith Telescope are both zenith telescopes since the use of liquid mirrors meant these telescopes could only point straight up. ↑ "Baby Name Guesser". Retrieved 8 December 2014. ↑ Corominas, J. (1987). Breve diccionario etimológico de la lengua castellana (3rd ed.). Madrid. p. 144. ISBN 978-8-42492-364-8. ↑ "Etymology of the English word zenith". My Etymology. Retrieved March 21, 2012. ↑ "Zenith". Dictionary.com. Retrieved March 21, 2012. ↑ "Zenith". Merriam-Webster. Retrieved March 21, 2012.